Girl Scouts are more than just cookies, camping, and crafts. This summer, viewers of the Disney Channel will begin to see just how this organization touches the lives of the girls involved, and how they in turn touch the world around them. Girl Scouting is about building the character and confidence of the girls involved with troops worldwide. Traits such as leadership and social conscience have led girls to brighter futures, while giving them the awareness and the ability to change issues that affect them here and now. Girl Scouts, a worldwide organization which serves ten million girls and leaders in one-hundred and forty-five countries, were recently given the opportunity to meet with the Cheetah Girls while they were filming their new movie, the Cheetah Girls One World, in India. The three inspirational girls, alongside the Cheetah Girls, were filmed for a segment of the Road to the Cheetah Girls One World, an ongoing series of clips already beginning to air. These young women have been working to raise awareness for cancer, again showcasing the skills that are so important for tomorrow's leaders and how they can help today. The meeting wasn’t all about community service and leadership, there were group hugs and plenty of dancing throughout the day. These girls are, after all, still girls and still like to have a good time. 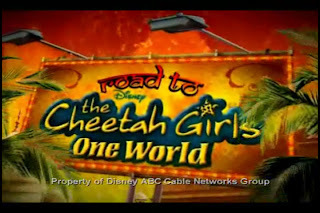 Be sure to keep an eye out for the Road to the Cheetah Girls One World segment featuring the Girl Scouts which will begin airing on June 27th on the Disney Channel. For more information about the Girl Scouts and how you can get involved, check out http://www.girlscouts.org/. Oh, and don’t think this is the last we have heard of the Cheetah Girls and Girl Scouts teaming up. While I cannot divulge anything else right now, let’s just say you’ll have to tune-in later this summer.